Earlier this week, I spoke at 2U’s annual employee conference. Redpoint partnered with 2U at the Series A, and they are now a $2B publicly traded education company that powers online degree programs for Georgetown, USC, Syracuse, Berkeley, and Yale, among others. It was an inspirational moment for me because I observed the intense power of developing strong company culture. I’ve never read the list of core company values or spoken to the executive team about them. But I’m quite confident that I could enumerate at least five of them. Having fun. I arrived at the green room about 2 hours before my allotted time to speak. The executive team also congregated there. After about 15 minutes, one of the executives started playing iconic 70s and 80s music, belting the melodies out and inviting others to join. Trust and Transparency. The entire company performed a personality assessment and the management team shared their results before the entire company on the stage. Such transparency creates trust and understanding, the cornerstones of great working relationships. Teamwork. In a moment of downtime, one of the executives began a conversation on a key strategic question for the business. I watched as she asked each of the other members in turn for their opinion, building consensus and considering different viewpoints. Supportive environment. As I was rehearsing my slides, I kept tripping on the one with the photograph of Mahatma Gandhi. Embedded in a section on decision making fallacies, this was the anchoring bias slide. I was supposed to say, “If I were to ask you if Gandhi was more than 114 years old when he died, your estimate of his age at his death would be much higher than if I changed the age to 35.” But I couldn’t remember that line. I tried several times, and finally abandoned it, and the audience couldn’t have been warmer, clapping and laughing with me as I bumbled onto the next topic. Investing in people. As a few of the executives shared with me, culture is a key part of the company and this annual meeting is a key part of that strategy. Culture is managing at scale. Culture starts at the top, and must be a key priority for the executive team. As Jeff Bezos said in 2014, “My main job today: I work hard at helping to maintain the culture.” It’s the way companies like 2U scale their teams across thousands of people. By inculcating values, management teams are able to influence decisions, whether hiring decisions, customer engagement decisions or product decisions. 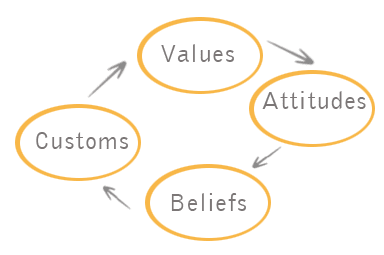 Values reaffirm attitudes, which create beliefs and create customs/influence actions. It was wonderful to see observe how a strong a culture the team at 2U have developed, and how universal their values are shared. I’m certain the culture has been a critical part of the company’s continuing success.